Turkey soup. Turkey casserole. Turkey sandwiches. Turkey and rice. Turkey salad. Turkey, turkey, and more turkey. It’s not yet Thanksgiving as I write this, so I’m still looking forward to the turkey and mashed potatoes and gravy and stuffing and rolls. I expect by tomorrow though, I’ll be done with turkey, except for turkey soup. Stud muffin boils the carcass with carrots, celery, and onion for a stock. Then adds the bits of shredded turkey that’s left, along with a grain of some sort. I think the best one we’ve tried with the turkey is barley. The barley is nutty and adds a depth of richness to what would otherwise be a pretty plain and basic broth. My mom is a charter member of the Start-the-Turkey-in-the-Middle-of-the-Night Club. Since it’s a well-known fact that turkeys take ten hours, give or take, to roast, I considered Mom brilliant and loving to sacrifice her own sleep and start the turkey at two am. Now, I think she just liked to have the quiet house to herself and the turkey was a good excuse, even though I grew up thinking Mom founded the club and was its smartest member. But then I met my husband, Dave, and his mother also started the turkey before dawn. We both grew up drenching the turkey in gravy to get moist breast meat. After six years of marriage, his job took us to Southern California and for the first time ever we didn’t have a mom’s or grandma’s home to go to on Thanksgiving. Because he almost always worked the holiday or the holiday weekend, we had to figure out how to roast our own turkeys. The first year, the turkey was dry because we followed our mothers’ instructions. 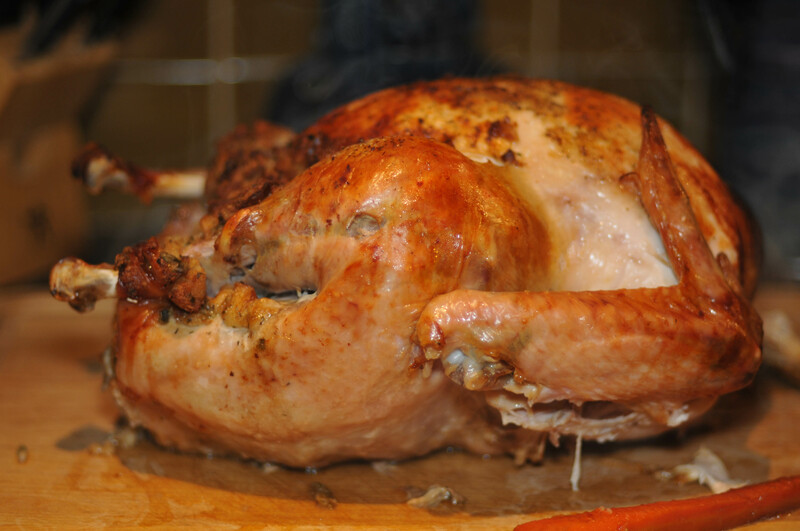 Instead of gravy though, we moistened the turkey with tears at being separated from our families. Over the next few years we learned that turkeys are considered done at 150-160 degrees, not the 180˚ to 190˚ we grew up with. Because of Dave’s work schedule, we began hosting a Thanksgiving brunch for our friends. After brunch, they would go to their family celebrations, Dave would go to work, my daughters and I would watch movies and snack on brunch leftovers. After eight years in Pasadena, we returned to the Valley. The first Thanksgiving back was again tearful. Because this time, I missed celebrating the holiday with our friends, and doing things my way in my home. I had to go and eat dry turkey. And Dave was still off working. A few more years later, we experienced two epiphanies: 1) Dave finally had enough seniority to get the day off and 2) we didn’t have to eat dry turkey. Dave and his brother conferred and decided to tell their mom that they would like to grill the turkey. She dubiously agreed. Her skepticism that a turkey could be roasted to doneness on an outdoor grill in less than ten hours extended far enough that she purchased and roasted a second turkey inside. At the end of the meal, the grilled turkey carcass sat next to the intact leather turkey. The next year was our turn to celebrate with my family and Dave volunteered to be in charge of the turkey. My mom was doubtful too, but said her back-up turkey wasn’t really a back-up. It was “because Dad likes his dressing cooked inside the bird.” That lasted just the one year and after that Dad had to eat his dressing like the rest of us and thus a new tradition was born: the next generation was in charge of the turkey. We have gradually taken on more and more of the meal preparation so that now, we host my family’s Thanksgiving gathering every other year. The bird is thawing. The coals are standing by. The dough is rising. 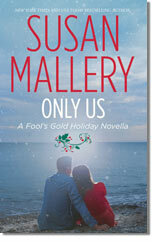 Only Us is a Christmas novella by Susan Mallery. It’s Christmas in Fool’s Gold, California, home to many of Mallery’s fun books, several of which I’ve reviewed here. Rina is in love with the vet, a single father named Cameron. He was deeply hurt when his wife walked out on him and their infant daughter. He’s raised Kaitlyn on his own and plans to keep it that way. He will never trust another woman. He doesn’t count on Rina and her love for him and Kaitlyn’s love for Rina. Their worlds are turned upside down by love. Only Us came out in 2011. Last year, I reviewed Christmas on 4th Street, and this year’s Fool’s Gold novella, Yours for Christmas, is available as an e-book or is a bonus in the mass market edition of Christmas on 4th Street. I haven’t gotten to it yet, but soon. There is something wrong when Christmas movies start airing before Thanksgiving. This is the first year I’ve started watching them before the beginning of Advent. I’ve only seen two so far, but they were both pretty good. The Nine Lives of Christmas was very sweet and charming with an adorable heroine and a Superhero hero. Really. The part was played by Brandon Routh, who starred in Superman Returns in 2006. After I stopped thinking of him as Clark Kent, I enjoyed it. 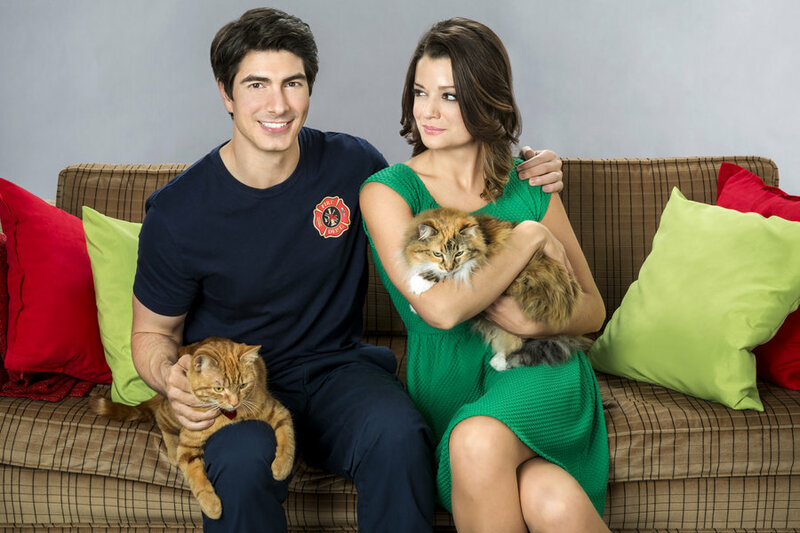 Routh’s character is a single fireman who flips houses in his spare time and is not looking for anything permanent. Kimberly Sustad plays Merilee White, a veterinary student and part-time employee at the local pet emporium. They have a cat, which gives the movie its name. If I had to categorize this one, I’d say it was Friends to Happily Ever After. She arrives uptight and business-like and ends up loving Christmas and falling in love with the son of the owners of the ski lodge. She gets sucked into their Christmas traditions and doesn’t want her father to raze the resort to rebuild something that caters to singles in their twenties and thirties. This one was cute and enjoyable too. The weak spot was the hero. He just wasn’t a very good actor and his unease in the role showed. Let It Snow would fall into the Enemies, to Friends, to Happy Ever After category. It’s 2013’s Candace Cameron Bure Christmas movie. There will be another on in just a few more days for 2014. Both Nine Lives and Let It Snow are good for passing a couple of hours with a cup of something warm while it’s cold and rainy / snowy outside. I discovered Liane Moriarty late last year. I reviewed The Husband’s Secret here (I loved it). When I noticed her book Three Wishes on sale for Kindle, I snapped it up. I read the first page just to see what I thought, and was hooked. I couldn’t put it down. Cat, Gemma, and Lyn are triplets. As tangled as they were in the womb, their lives continue to intertwine and overlap as adults. Cat and Lyn are married. Lyn has a child. Cat wants one. Gemma has neither a husband nor a child and is fine with it. Then Cat’s husband makes a confession and no one’s life is ever the same. There is quite a bit of backstory, (some it going back to the womb), but it’s skillfully woven in so it answers questions Moriarty cleverly planted in the narrative ahead of time. I’m on the library’s wait list for her newest, Little Big Lies. Last time I checked, I was up to 10th place. I can’t wait for the call: “A book you requested is available.” Happy day! Rules are for a reason. My rule to not watch a new show in its first season is a good one. I’ve been burned by the networks before. I watch. I like. I get hooked. They cancel. So I quit watching first seasons. It wasn’t a perfect system, but it worked for us. This year, I broke the rule. I saw a few ads for A to Z. I remembered the male lead from Drop Dead Diva and liked him, so decided I’d try the premiere. It was good enough that I added it to my DVR’s To-Do list. And of course, the network canceled it last week. After the filmed thirteen or so episodes, it’s over. I’m sorry, A to Z, that I broke my rule. Your cancellation is likely my fault. Was the show awesomely perfect? No. But neither was Frasier when it debuted. I remember being underwhelmed. But they found their footing and made it work. A to Z is about Andrew and Zelda (A for Andrew, Z for Zelda, get it?) and their relationship from meeting to … we will never know. The opening narrator says Andrew and Zelda dated for eight months, five hours (I think), and eighteen minutes. And this television show is the chronicle of that relationship. She doesn’t say if they get married or break up at the end of that time. And now we’ll never know. See? Rules are for a reason. Do you have rules about new television shows? Do you give them one chance to grab you or will stick with them for a few weeks? I’d heard about it but never visited one until this last weekend. Hubby ate at one in the Bay Area a couple of months ago and came home raving. We heard there’s one in Visalia, definitely doable for a lunch or dinner, especially since we can combine it with a visit to Darling Older Daughter. But I’m no longer a Dickey’s wannabe. I’ve been. Hubby ordered the sampler plate of pulled pork, chicken, and brisket for us to share. The sides were mac & cheese and loaded mashed potatoes. I was starving when we arrived. And I’m not being overly dramatic. Well, maybe a wee bit. But I was very, very hungry. Normally, if I were ordering, I’d have gotten something that counted as a salad or green veggie, but I was so hungry that I embraced the protein and carbs like long lost friends. Which they sort of were. The mac and cheese was maybe the best I’ve ever had. At least in the top two or three. And I’m picky about mac and cheese. Dickey’s was creamy and had plenty of sauce clinging to the elbow macaroni. The loaded mashed potatoes were full of flavor and had a good ratio of toppings (scallions, bacon) to potato. The brisket was tender and flavorful, falling apart to the fork. The pulled pork had just the right amount of seasoning, a tricky thing to execute well. The chicken was the least exciting, but it still was tender and tasty. Since I’m currently on a tomato fast, I had to skip all the sauces, so I can’t say how spicy/sweet/tangy they were. There’s a soft serve machine with cones to finish off the meal. The vanilla cone was the perfect finish to the highly seasoned meal. Cool and creamy and a bit sweet. I’m ready to go back anytime. Or at least make a foray to Visalia. There are lots of other sides to taste test.